This photograph has been one of my favorites for some time now. Left to right we have: Mary W. (Rulon) Marnie, William Rulon Marnie, and Edwin T. Marnie. 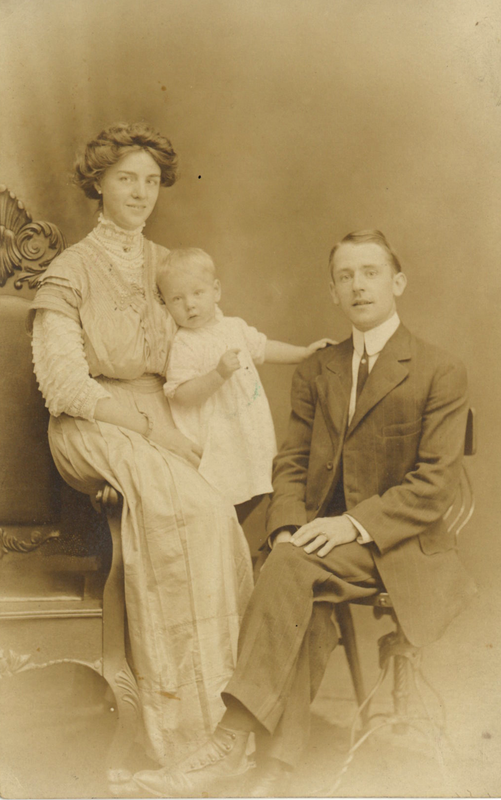 William was born in 1909, so this photo was taken within a few years. One of the things I love about this photo is that Mary Marnie is smiling. There are a handful of photos of her, but very few where she’s smiling. I always think she looks so serious, but in this case she looks content. The other thing I love is the detail visible in their clothing, from Mary’s lacy, ruffled sleeves and jewelry to Edwin’s pinstripe suit, shirt collar, and shoes. Details that give insight into what someone’s life was actually like is perhaps the most important part of research to me. Vital statistics are great, but the details provide the color. This small, faded, torn photo was found jammed inside an album. It’s printed on normal paper, as though someone photo copied the original image. The photo is fairly small, which certainly wasn’t uncommon. I happened to scan and enlarge the image, just because I wanted to preserve it, but what I found has been far more interesting. Front row, sitting—Florence M. Marnie (1883-1962), Sarah (Smilling) Marnie (1860-1901), Edwin Goutch Marnie (1855-1913), Ann Wagner (Ottey) Rulon, and Mary Wagner (Rulon) Marnie. I know that Edwin T. Marnie married Mary Wager Rulon in Philadelphia in 1907. He was 23, she was 20. They had their first and only child in 1909. What happened to Edwin Goutch Marnie’s right hand/arm? Once the photo was enlarged, I realized his right hand and arm don’t match the left and he appears to be wearing a black glove on the left hand. It’s hard to tell, but it appears the left hand or arm is a prosthetic. How and when did this happen? Sarah (Smilling) Marnie died in 1901 according to an obituary and Philadelphia death certificate. In 1910, her husband and son are in the census listed as boarders. Edwin is listed as widowed. So, was this photo taken before Sarah Marnie died in 1901 (indicating the families knew each other well before the marriage in 1907) or is the woman not Sarah Marnie at all? Perhaps Edwin remarried or the woman is his sister, Lavinia Marnie (1861-?). The woman, who could be Sarah (Smilling) Marnie or someone else, is also pictured in other photos with Edwin T. and Mary W. Marnie and their son. Whoever this is, she definitely lived past 1909 when Edwin and Mary’s son was born. 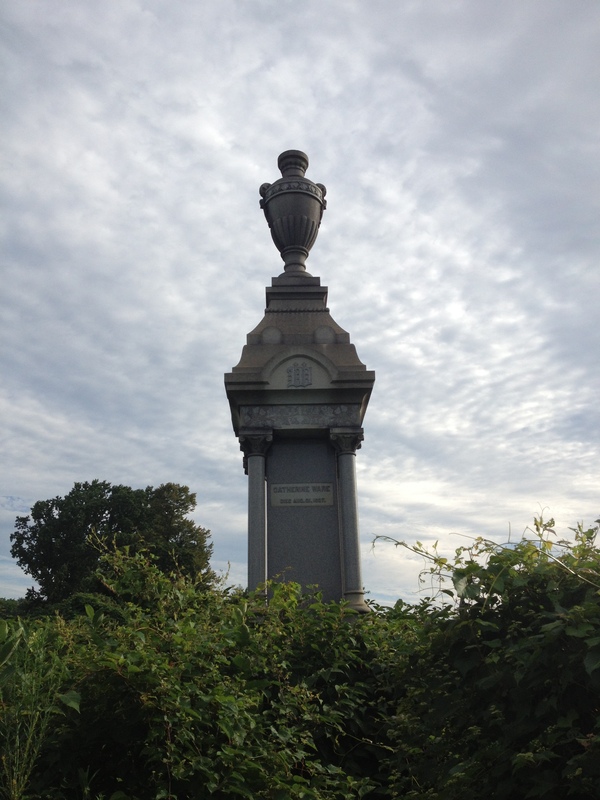 This past weekend I attended a restoration event at Mount Moriah Cemetery in Philadelphia. Before work began for the day, one of the board members took me to visit Catherine Ware’s monument on the Yeadon (Delaware County) side of the cemetery. The plot is so overgrown that only the top half of this huge monument is visible right now. All that overgrowth is at least 5 or 6 feet high. For comparison, consider the photo I originally posted of Ann W. Rulon standing in front of this monument. Better yet, here’s a photo of the Ware plot with the whole thing cleared. According to the Friends of Mount Moriah, this overgrowth only occurred in a few short months as the plot was cleared in the spring. The Friends of Mount Moriah Cemetery are doing incredible work trying to preserve the history of this cemetery in Philadelphia. The all volunteer group are trying to win the battle against invasive plants and overgrowth. You can learn more about the history of the cemetery and what led to the formation of the Friends of Mount Moriah on their website. If you live in the Philadelphia area, come on out for a restoration event and help us reclaim this beautiful space! Whether near or far, I encourage everyone to consider a donation to the group. Even $5.00 puts some gas in the mowers! One thing I always asked with my husband’s parents about was photos – specifically whether or not they had any. They were able to give me some pictures, but didn’t seem to have anything old. Nothing black and white. Nothing with grandparents and beyond. When we were cleaning out their house in preparation for a move, I uncovered a musty, ripped paper shopping bag underneath a pile of junk. Stuffed inside was a photo bonanza – this falling apart photo album of the Marnie/Rulon families (pictured) and stacks of loose black and white photos. In the garage. In a bag. Underneath a pile of junk. I sat down in the middle of the garage and wept while looking at the photos. I’m still trying to figure out who is who. Much of it is guess work based on the people I can identify. Have you had this kind of experience during your own research? One of the few photos my father-in-law was able to identify for me was “Gran’s wife”, Mary. I have no idea when this photo was taken, but I’m guessing somewhere around 1910-ish, based on what she looks like in a 1910/1911 photo that includes her son, William Rulon Marnie, who was born in 1909. Mary Wagner Rulon, born in Philadelphia, PA on September 30, 1887. She was the daughter of William Batten Rulon and Ann Wagner Ottey Rulon. Mary was baptized at Scott Methodist Episcopal Church on April 1, 1888. At 20 years old (1907), she married Edwin Thomas Marnie. They have one son together, William Rulon Marnie, born 1909. According to my father-in-law, he believed Mary and Edwin (“Gran”) were separated, divorced, or otherwise estranged. But she died in 1946, well before Edwin who died in 1979 at 94 years old. In 1942, Edwin’s WWII registration card lists both of them at the same South Philadelphia address and I’ve never found evidence of them living apart. My father-in-law knew Edwin for the better part of a decade. Perhaps he just assumed a separation or divorce because no one talked about Mary. It was more than 20 years after her death. Happenstance. I connected with someone on Facebook who is researching the Rulon family in NJ and PA. Not the same direct family group as me, but she sent along a few newspaper clippings that relate to my research of the William Batten Rulon and Ann Wagner Ottey Rulon family. One piece was an obituary from 1907 for Catherine Ware that indicated her funeral services would be at the home of her niece, Mrs. William B. Rulon of 1516 South 8th Street (Philadelphia).